I had this idea for our family Christmas cards this year. I wanted to do the J-O-Y paper mache letters and add the wording “to the world” to the card to quote one of my favorite Christmas songs. First, I got J, O and Y in the 24″ paper mache letters from JoAnns, some gold glitter and some regular Elmer’s school glue. Next, I took the glue and squirted it out over the front face of the letter. Then, I used a foam brush to spread it evenly all over the front. 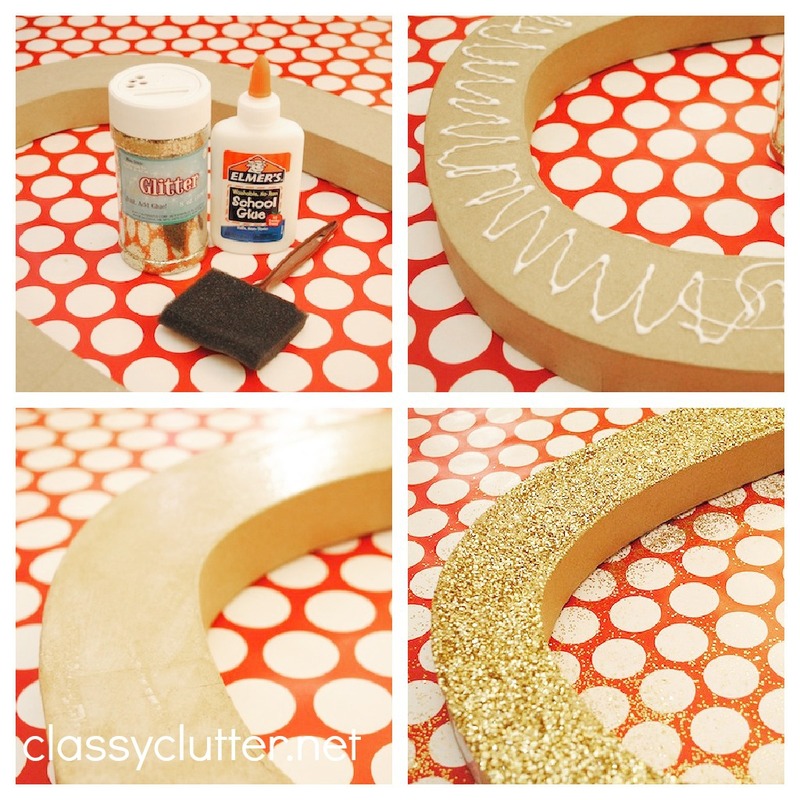 Next, glitter it up! I thought I needed a ton of glitter but it actually covered really well and I didn’t need near as much as I thought. I really loved how they turned out! 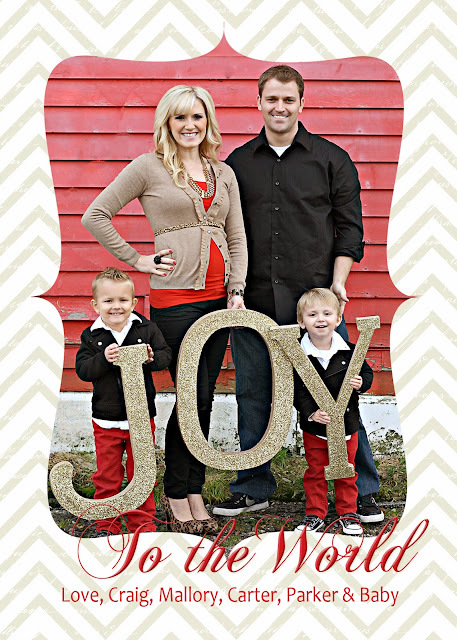 Then, I had a friend take some photos of my little family and made our Christmas card! I’m actually quite proud of it because in my 6 1/2 years of marriage, I’ve never sent out a Christmas card! Gasp!!! 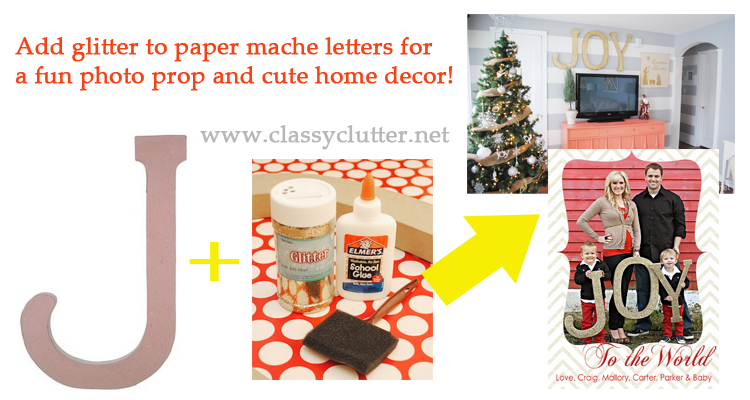 The letters then sat in the back of my car for about a week or so until I began gathering ideas for my Christmas decor. I had a thought to hang the letters up on the wall. For fun, I held it up above the tv and fell in love with it. I also used Savannah’s collection of vintage hand painted signs as inspiration for my own sign. and…. here it all is! 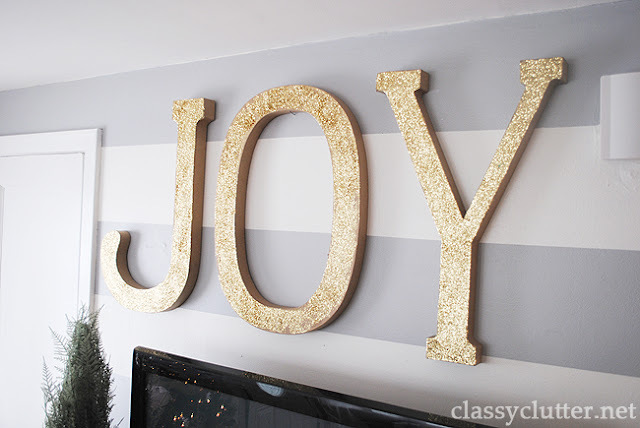 I’m so glad I found a spot to hang my JOY letters. 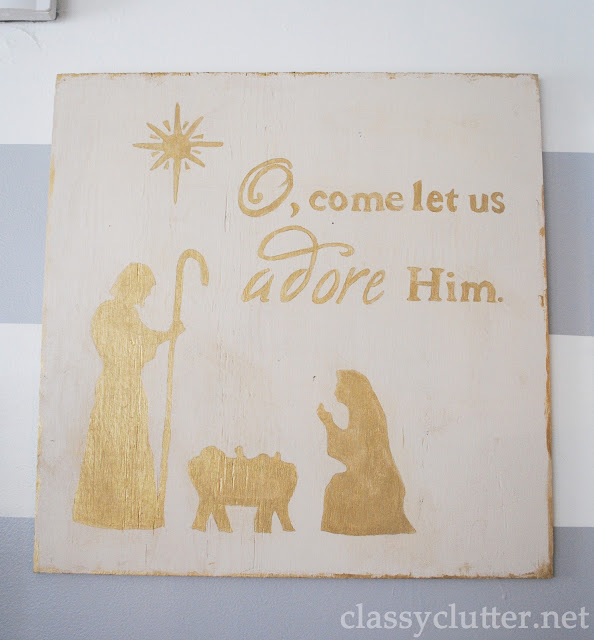 Soon, I’ll show you some more of my Christmas decor for 2012. I really love it and so happy my letters aren’t still sitting in my car or closet! haha! What do you think!? Is your Christmas decor in the works?? Like this idea and this post? Please consider pinning it! Adorable picture. I love how they look on the wall too. Great idea! This is super cute! I am going to the craft store today! I guess I will be picking up some big letters… Your family is so beautiful! Congrats! Oh my gosh…that’s adorable and you look AMAZING!!!! I’m in love with those ideas! LOVE! Your home is adorable! Thanks for the Christmas decor inspiration. I also LOVE how you decorated your Christmas tree! I think you are absolutely gorgeous!!!! And your family is beautiful! So glad I get to call you my sister! 🙂 I can’t WAIT to get your Christmas card in the mail! Hug those boys for me! XOXO! What a beautiful family picture!! I have been wanting to do Christmas photo cards for a couple years no but time always gets away from me or I find that it’s just not in the budget. I love your card though, it’s very pretty! You have a beautiful family! What a cute idea. Love the photos… beautiful family. Super cards! It all looks great! those three letters are so adorable: both as a photo prop AND on the wall! Very cute family, card and letters! Thanks for sharing. What program did you use to make your cards in? Or did you order them from another company? LOVE this idea! I made them in photoshop and had them printed on mpix.com. Just curious what you used to hand them? Thanks! When I first made these, I used small nails. They’re super light so this year I used 3M command strips. Thanks so much for stopping by! Super cute! What a darling Christmas idea.